This is a word used to describe the feeling a patient experiences when the heart receives insufficient blood enriched with oxygen. Patients experience chest tightness or heaviness brought on by effort and relieved by rest. The sensation starts behind the breastbone and radiates across the chest. It is frequently associated with a leaden feeling in the arms. Occasionally, it may present in more unusual sites, e.g. pain in the jaws or teeth on effort, without pain in the chest. It may be confused with oesophageal (food-pipe) pain, or may present as pain in the pit of the stomach. 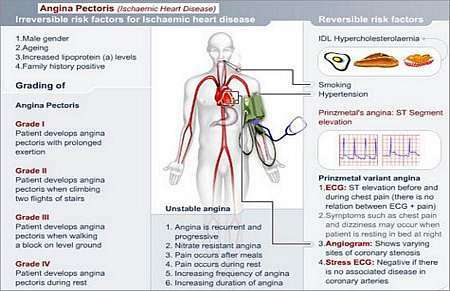 There are many causes of angina. In a western population, disease of the blood vessels (the coronary arteries) that supply blood to the heart muscle is the most common one. This disease causes a narrowing of these blood vessels. When this is greater than 70 %, patients usually present with angina. Inability of the aortic valve to open sufficiently. This valve opens and closes to allow blood-flow from the heart into the body via a large artery called the aorta; normally, as this valve opens, blood enters the circulation from the heart. 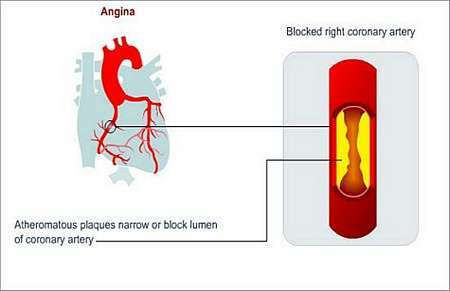 If the valve does not open enough (aortic stenosis) the amount of blood flowing down the coronary arteries is reduced and the patient will experience angina. Severe anaemia (insufficient oxygen-carrying capacity of the blood). A resting electrocardiogram (ECG) and an exercise stress test. Uncommonly, the ECG is abnormal at rest. 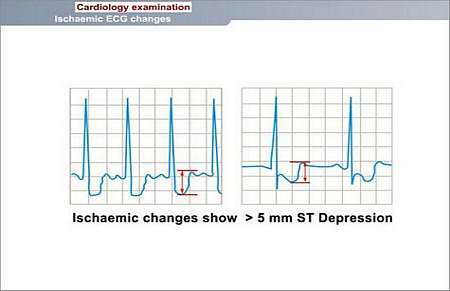 Most often the ECG becomes abnormal during the exercise test and then normalizes after a period of recovery. On occasion, the patients symptoms are very classical, but these tests are normal. A coronary angiogram is often done to confirm the diagnosis and to decide on treatment options. Occasionally, an ultrasound (sonar) of the heart is also done. Angina may be treated with medication, or some form of surgery. The latter includes opening (dilating) the narrow coronary artery with a balloon and/or a special expandable metal object (stent), or cardiac surgery (coronary artery bypass). Those with extensive disease and a weakened heart usually undergo a bypass operation. 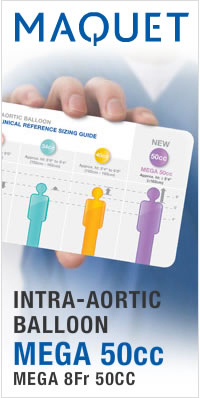 For those with less extensive disease, it may be technically possible to dilate the arteries with a balloon or stent. For patients in whom this is not an option, medication is often prescribed. Some patients may receive medical treatment and undergo surgery. Finally, in the minority of cases, surgery may not be an option due to technical reasons, or because of other associated diseases that place the patient at a high risk of dying during surgery. For these patients, medication remains the only treatment option. The aim of medical therapy is to reduce the amount of oxygen required by, or to increase the amount delivered to, the heart muscle. Unless there are contra-indications, all patients should drink half an aspirin per day; this helps preventing blood cells from clumping together and worsening coronary artery narrowing. Current therapy, as outlined, has dramatically improved both the quality of life and patient survival. Untreated, angina can precipitate a heart attack or even sudden death. The prognosis depends on the extent of the coronary artery disease and the strength of the heart muscle. Patients with widespread disease and a weak heart are at the highest risk of dying. However, in many instances, successful bypass surgery will improve patient survival.